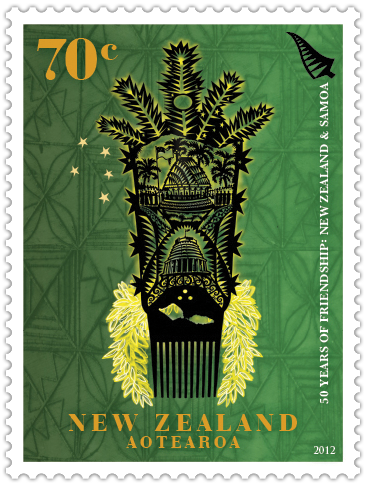 New Zealand and Samoa share a special relationship that is underpinned by the 1962 Treaty of Friendship. 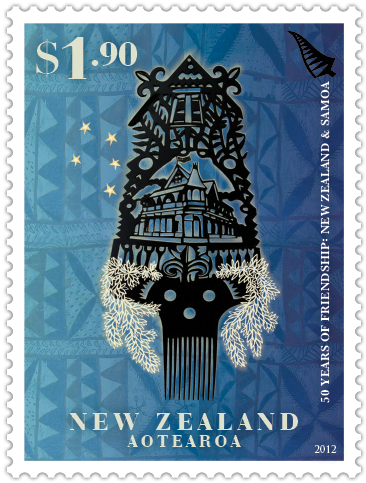 2012 marks 50 years of this important partnership, and New Zealand Post celebrated this with very a unique stamp issue. 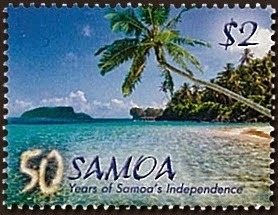 At about the same time these stamps were issued Samoa celebrated 50 years of independence. 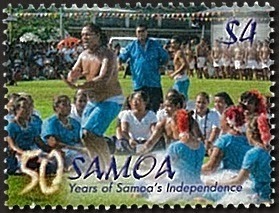 The stamps issued by Samoa to mark this event can also be seen at the bottom of this post. 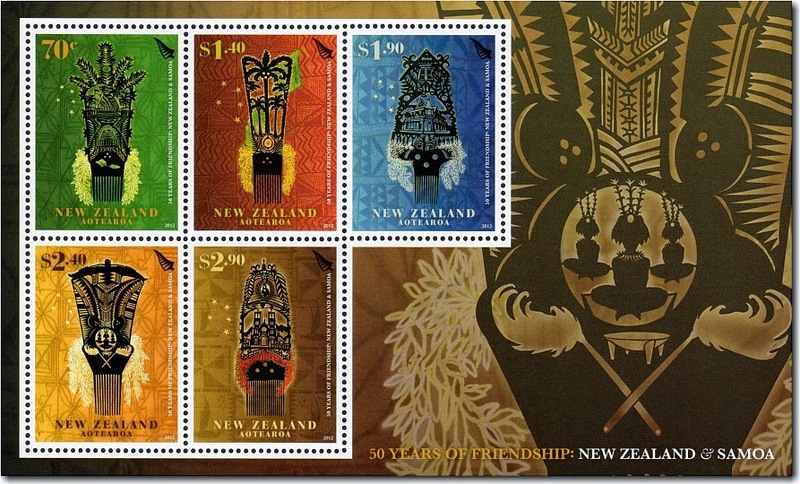 An interesting set of five stamps that stand out as being very different to stamps usually issued by New Zealand. 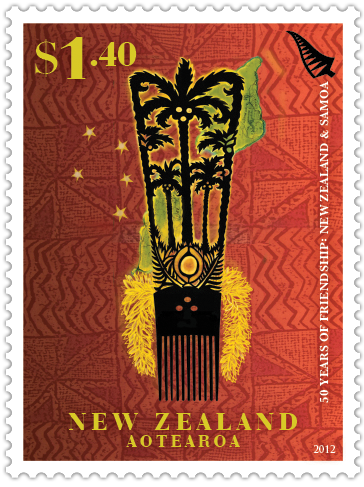 Each of the five stamps features a contemporary view of a selu tuiga – a head comb that takes the shape of a traditional tuiga. A tuiga is a Samoan headdress that is worn at important events by the mānaia (son) or the taupou (daughter) of the high chief of the village. The tuiga is a unique symbol of the chiefly nature of Samoan society, and a significant number of tuiga were worn when Samoa gained independence. 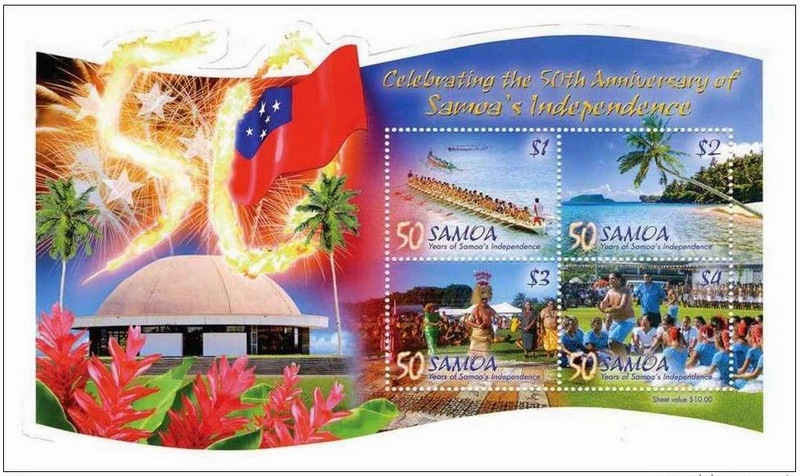 Fu’a is the Samoan word for flag and the fu’a of independence flies in front of the original Samoan Maota Fono or Parliament House. This Maota Fono was built in the shape of a circular Samoan meeting house. Chiefs and orators have discussed issues in a circular manner since time immemorial – making the form of the circle a traditional and sacred symbol. The coconut tree or niu is a very important tree for sustenance. For thousands of years, the lives of the Samoan people depended on this tree of life. It provided food, milk and oil as well as shelter, baskets and other woven artefacts used by Samoans in their everyday lives. The Maota Fa’amasino or the Courthouse building is 110 years old, and one of the oldest buildings in the city of Apia. The building was built by the Germans in 1902 and has seen two foreign administrations (Germany and New Zealand) occupy it, before Samoans took over after gaining independence from New Zealand. 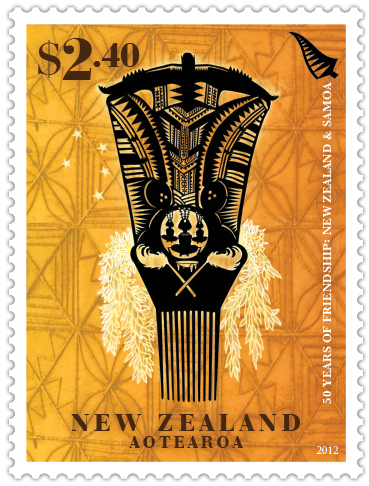 Traditional Samoan tatau (tattoo) motifs and patterns are taken from nature. There are the tulī (godwit) bird, the centipede, the trochus shell and the ‘aso, the rafters of a fale on to which thatches are lashed, and a number of other shapes including a va’a (twohulled canoe) that sits at the top on the back of a male tatau. Malumalu o le Atua means ‘church building’ and the Catholic Church’s Immaculate Conception of Mary Cathedral at Mulivai was a symbol of spiritual sustenance that graced the shoreline of Apia Harbour. Sadly, the Cathedral was demolished after 127 years, when the 8.1-magnitude earthquake of September 2009 shook it to an irreparable state. Miniature Sheet & First Day Cover. Of course the usual collector items were released as well. 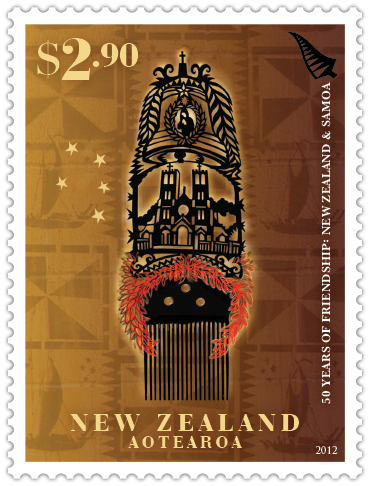 Here again the designs stand out against other New Zealand stamp. 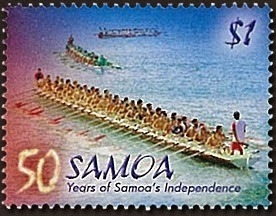 50 Years of Samoan Independence. 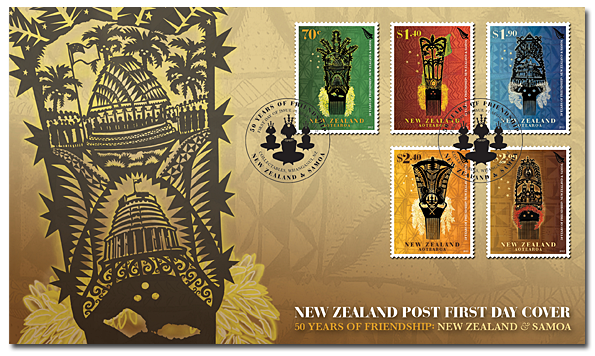 While these four stamps are not New Zealand stamps, they are related to those above. I therefore decided to include them here. Samoan multi-oared whaleboats, traditionally used for travel between islands. Palm trees, blue ocean, what we all imagine Pacific Islands to be. $3 - Singing and Dancing. 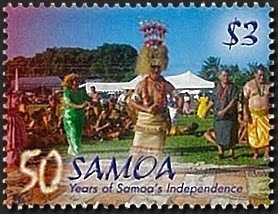 Samoan Independence Day is always celebrated with lots of singing, dancing and feasting. Singing and dancing on Independence Day. When I discovered this miniature sheet, I just had to include it on this page.